Click here to sign up for a one-hour time slot during the 24-hour vigil. World AIDS Day is held on December 1 each year around the world. It is an opportunity to raise awareness, commemorate those who have died, and celebrate victories such as increased access to treatment and prevention service. Since the beginning days of the epidemic in 1981, Maryknoll missioners in Asia, Latin America, and Africa have been working in ministries serving persons living with HIV and AIDS. Maryknoll Lay Missioner Dr. Susan Nagele (pictured on left) is one of them. 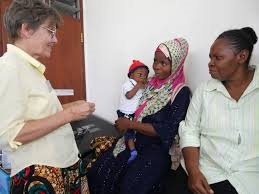 In the current issue of NewsNotes, Dr. Nagele, a family physician who recently returned to the United States from East Africa after 33 years of service, describes some of the challenges facing people with HIV and AIDS in Kenya and Tanzania. Join the 24-hour prayer vigil – Pray for those living with HIV and AIDS and for those whose lives were cut short due to HIV or AIDS. The vigil will begin at 12 AM Eastern Standard Time (U.S.) on December 1. Pray with and share the Maryknoll AIDS Task Force prayer.